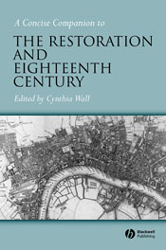 This Concise Companion presents fresh perspectives on eighteenth-century literature. Contributes to current debates in the field on subjects such as the public sphere, travel and exploration, scientific rhetoric, gender and the book trade, and historical versus literary perceptions of life on London streets. Searches out connections between the remarkable number of new genres that appeared in the eighteenth century. Crosses conventional disciplinary lines. Demonstrates that philosophy, history, politics and social theory both influence and are influenced by literature.